ArtRage for iPad 2.0 was a pretty major update, and it came with few changes and, alas, a few bugs. We can’t respond to reviews left on the iTunes App Store, but we’ve noticed that people are asking questions and reporting issues there, So we decided to answer them here and hope our answers are useful to somebody. Most of the problems have now been fixed, or will be fixed in the next update (check out the update history of features and bug fixes here). There are plenty of good reviews mixed in, but we’re not going to focus on those, just the people with actual questions that need answering. Your active References and Tracing images will appear in this menu. You can edit, remove and hide them using the cog symbols. We have full support for the Adonit Jot Touch, Wacom styluses, Adobe Creative Stylus, and Pogo Connect 2. You can set up your stylus by opening the menu and going into Preferences. See the official guide to supported styluses here. We don’t currently support the iPad Pro’s extra features, or the Apple Pencil, and we don’t say that we do on the store, but the update is coming really soon! ArtRage will definitely work on the iPad Pro right now, though. The ArtRage iPad 2.0 update was pretty major, and a few things did change, but we didn’t remove any options, and the new layout was designed to improve workflow and make it easier to use for artists. We do understand that there was an adjustment period for some people, and if you can’t find a specific option, please contact us and we’ll tell you exactly where it is. We also included a quick start guide and online help files, which can be found from the menu in the app. The Color Samples can be found from the little folder icon next to the color picker. The square + arrow symbol under the color picker allows you to quickly add the selected colour to your samples. Your tool shouldn’t be acting any differently. Some of your custom tool settings might have been reset to defaults, and we added a few new options, but we didn’t change anything about the way the tools themselves work. If you’re struggling to get a very specific effect back, contact us and we’ll see if we can help. This has now been fixed. This was caused by people selecting a stylus when they weren’t using a stylus, or had a stylus without Bluetooth, so the app ignored their input. This meant that you couldn’t draw until you’ve manually turned off the stylus in the ArtRage preferences, but you could use the menus. We didn’t expect people to be turning styluses on when they didn’t need them, so hadn’t planned for this when we updated the stylus support for version 2.0. We found that a lot more people seem to be closing ArtRage by double tapping home button and then dragging upwards to close it from the multitasking dock. This forces ArtRage to shut down instantly, so it doesn’t get a chance to save the current painting properly. This process isn’t something we can control, it is built into iOS itself. iOS9 was released at about the same time as ArtRage 2.0, and was responsible for some system changes. We have implemented improvements to make it harder to shut down a painting before it’s finished saving without meaning to, and to protect your saved files, in our next update. This one is an actual bug, and we know this is a serious problem for users, but we’re glad to say that it will be fixed in the next update (thanks to a couple of users who reported it and were patient enough to jump through hoops troubleshooting it with us!). We discovered that after ArtRage had been shut down by iOS (as in the previous example), it sometimes opens up to a blank canvas. Saving this canvas would overwrite the last saved painting. If this is happening to you, go to the gallery without saving, and you should be able to find your painting unharmed. The most likely cause of crashes is running out of memory, which causes the iPad to just shut the ArtRage app down. Clear out your parked apps, save your painting regularly, and consider upgrading your device, if you see memory related crashes often. We fixed a few crashes introduced in the first major update for 2.0. If ArtRage crashes on you with the latest version, and it isn’t memory related, then this is a new bug and we would really like to hear from you, especially if you can spot a pattern to it (E.g. every time you make a stroke with a certain tool, or undo, or something else). Closing all other parked apps, restarting the iPad, or leaving the current painting to clear out the undo history (which can become a very large file if you paint for a long time). Avoiding very memory intensive features in ArtRage, such as very large reference image files, large canvas sizes, the Watercolor tool and the Soft (v-shaped) Palette Knife. If you need to create large resolution paintings, but your iPad can’t cope, you might want to try recording a script and playing it back on a desktop version of ArtRage instead. 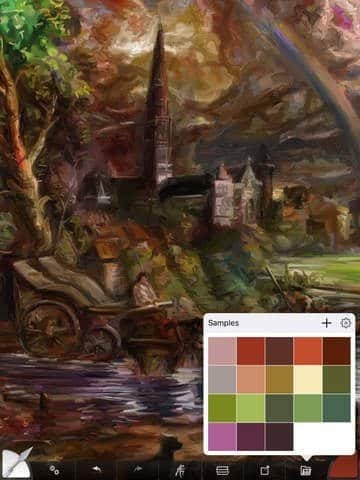 Reducing the number of layers and reference images used in the painting. The beginning of the stroke may not always appear instantly, and will catch up as you draw. This is something we are working on improving, but it’s caused by ArtRage and iOS needing to recognise that you are making a stroke, and then acting on it, rather than the app performing slowly. Large tool sizes will display a visible gap between your stylus/finger point and the end of the stroke. This is the area covered by the Outline cursor on the desktop, the projected area of the stroke that you are about to make. Small tool sizes will also have this, but it will usually be too small to see. The stroke gap will always be a consistent size relative to the size of the tool, and will only ‘fill in’ when you move your paintbrush along. Again, this is something we’re working on improving, but it’s a fundamental part of the real-time realistic paint simulation. Experienced ArtRage users are generally quite used to it, and don’t even notice, but we understand it can be quite jarring for newcomers. The stroke gap is a constant size relative to your tool size. It increases with larger brush sizes, and is approximately the size as one ‘dot’ made at full pressure. The ‘stroke gap’ looks different with different tools, sizes and cursors. It is much harder to spot on a mobile app, such as ArtRage for Android or ArtRage for iPad, as these apps have no visible cursor. It is often confused with lag on these devices. Tap the screen with three fingers to get it back. The three finger tap shortcut to show and hide the toolbar was also in the previous version, but it seems to be catching a lot more people out in the update. There’s a Color Bleed slider in the tool settings! Open the Settings to access individual tool settings and presets. Unfortunately, we don’t have Chinese language support in the app the moment. ArtRage for iPad supports English, French, German, Italian, Spanish, Japanese, and Korean. We love you too and really appreciate the review! If you enjoyed the updates we made to the app, please rate us! 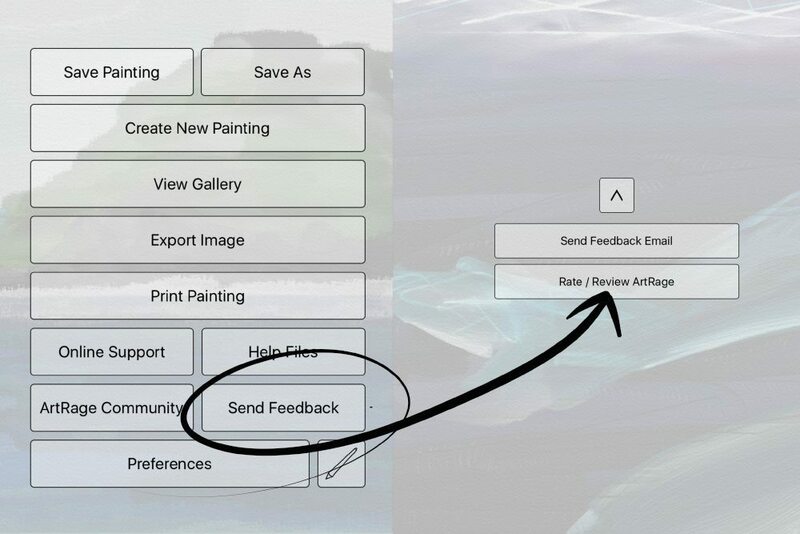 It’s very easy to review ArtRage for iPad, just make sure you have an active Internet connection, open the menu, and choose Send Feedback. 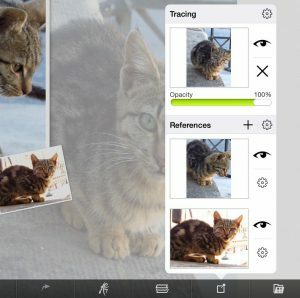 You can rate ArtRage for iPad From the menu! Or just go straight to ArtRage on the iTunes App Store.